A lot of mud, wind and some frigid temperatures couldn’t keep Beavercreek’s Taylor Ewert from smiling as she won the Division I girls race, Nov. 10 at the state cross country championships at National Trail Raceway in Hebron. Wilmington’s Simon Heys hugs his coach upon learning that he’d finished 20th, earning him a spot on the Division I boys All-Ohio team, Nov. 10 in Hebron. 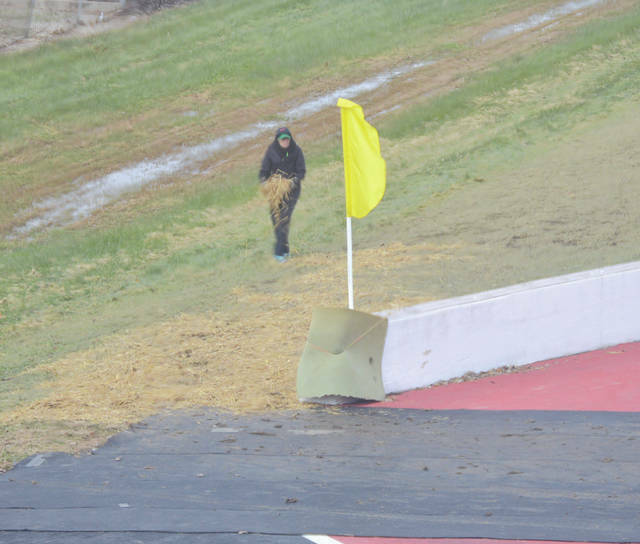 An Ohio High School Athletic Association course official places straw on parts of the course that became muddy, during the Nov. 10 state cross country championships at National Trail Raceway in Hebron. 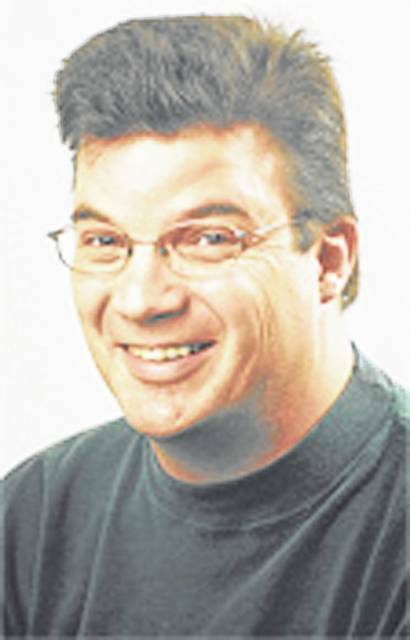 COLUMBUS — After watching the state’s best cross country runners endure the frigid temperatures, while slipping and sliding through the 5,000-meter course at National Trail Raceway on Nov. 10, I’ve gained a new level of respect for the athletes themselves. With wind-chill temperatures in the low 20s, there were 1,078 runners out there competing — in shorts and sleeveless shirts! I don’t know how they run in such cold temperatures without a limb freezing up and falling off. My day was spent bundled up in my Nanook of the North winter parka. It had some sort of a rust stain on one of the sleeves, but I didn’t care. I wasn’t there to make a fashion statement. I was there to survive the elements. Maybe the runners are warmer because they’re moving. One by one, the now mud-clad runners would finish their race. Almost immediately after they’d stop running, several of the runners would clutch at their chests. The cold air they’d been breathing was now burning in their chests, as their heart rates slowly began to slow down to some form of normalcy once again. Ethan Wallis of Cedarville placed 15th in the day’s first event, and he grabbed at his chest so hard that I nearly summoned medical help for him. Then a fellow runner offered him congratulations, and Wallis turned and thanked him. Normalcy for cross country runners. These athletes are used to enduring the elements. Pain is another day on the course for them. They begin the season by training in the heat of the fading summer. They end it in the snow and the cold of winter. And somehow, they like it! Congrats to all of the runners who endured the mud and the slop and the wind and the cold, all for their teammates and for their schools. Each of you are talented, amazing running machines. Hopefully you’ve thawed out by now. BELLBROOK BLUES TO BRILLIANCE: My favorite moment of the cross country meet was when I caught up to Bellbrook girls runners Minami Ford and Emily Pelfrey. They were very sullenly making their way from the runner’s tent at the finish line back to their team’s tent in the track paddock area. The two harriers were distraught. They appeared as if they’d just run the worst races of their careers. Their running uniforms don’t have pockets for keeping cell phones handy, and so they had no idea that the combined performances of the Bellbrook runners had just earned the Golden Eagles THIRD place in the state! I relished the opportunity to tell them the good news. Upon hearing the news, the two Golden Eagles gleefully hugged each other in celebration, and began crying tears of joy. Seeing them go from blues to brilliant smiles made my day. That is the highest that the Bellbrook team has ever finished at the state meet. HURRICANE HAPPINESS: My second best moment of the cross country state championships didn’t even involve a runner or coach from a local Greene County area team. I was looking into the runner’s post-race tent, trying to find Carroll’s Grant Arnold among the 186 runners in the boys Division I race (like finding a needle in a haystack, except the needle was really tall and wore a distinctive headband to keep his ears warm) when I heard a runner to my left ask his coach “Coach, did I make it? Did I make it?” in almost a worried tone, as if he thought he might’ve run a good race, but was worried that, with the ridiculous conditions, that maybe he hadn’t placed high enough to earn All-Ohio honors as a finisher in the top-20. His coach nodded excitedly. 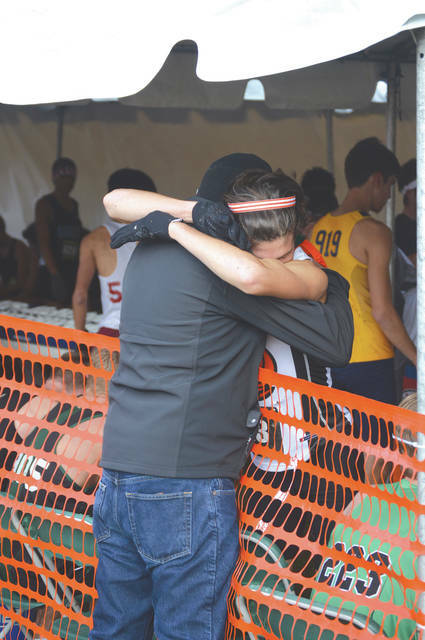 When Wilmington’s Simon Heys learned he had indeed placed 20th, in his final race as a Wilmington Hurricane, he broke down and cried, and gave his coach a huge heartfelt hug. To beat their own best times. To beat the best that the state has to offer. That is why these kids do this. And they have my utmost respect. John Bombatch has finally thawed out. You can reach him at 937-372-4444, Ext. 2123.